where your mouth is. That’s just what I did last week in the Brian Kenny Show Fantasy Baseball League. with Kenny, his producer Mike Urrunaga, and three listeners. The format is a little different than your typical fantasy league. Instead of the standard 5×5 format, or the original 4×4, this is 6×6. along with Quality Starts and Saves+Holds (instead of Saves only). 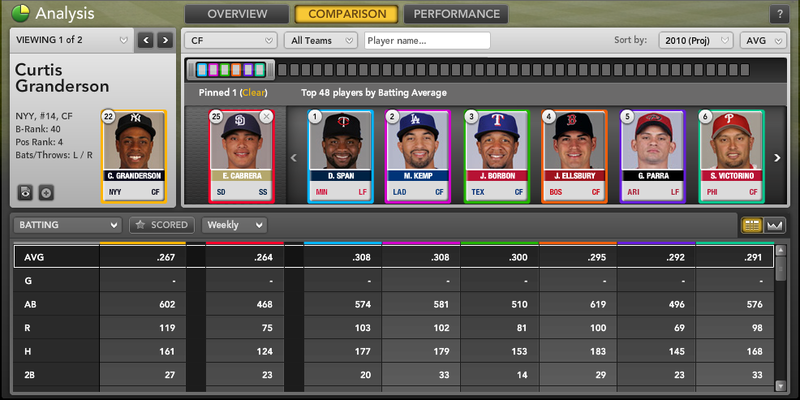 strong on-base percentages and slugging averages. this year, Alex Rodriguez was gone, and I trusted Longoria’s improving game and stacked Rays lineup over David Wright, the 10 home runs he hit last year, and his abysmal Mets teammates. early, but you don’t say no to Halladay at this point of the draft. 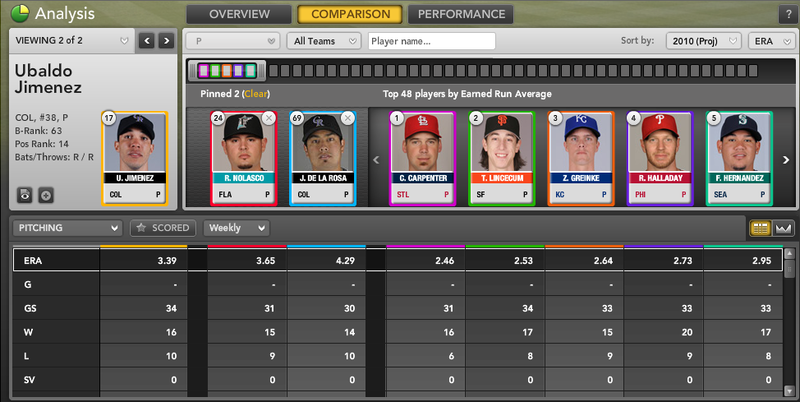 made Halladay (and other top SP) more valuable. wanted. 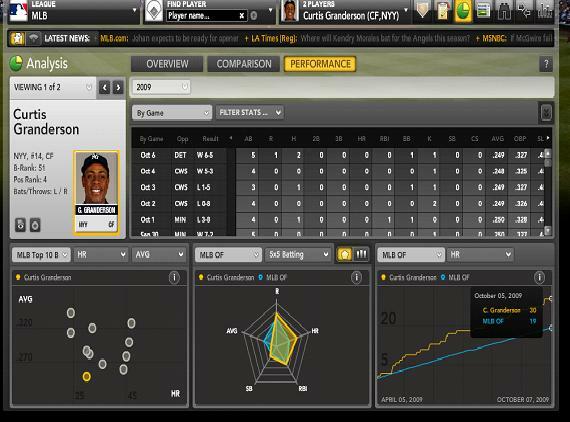 In Round 4, he was jonesing for Rays outfielder B.J. Upton. a horrified on-air reaction, only made the pick sweeter. 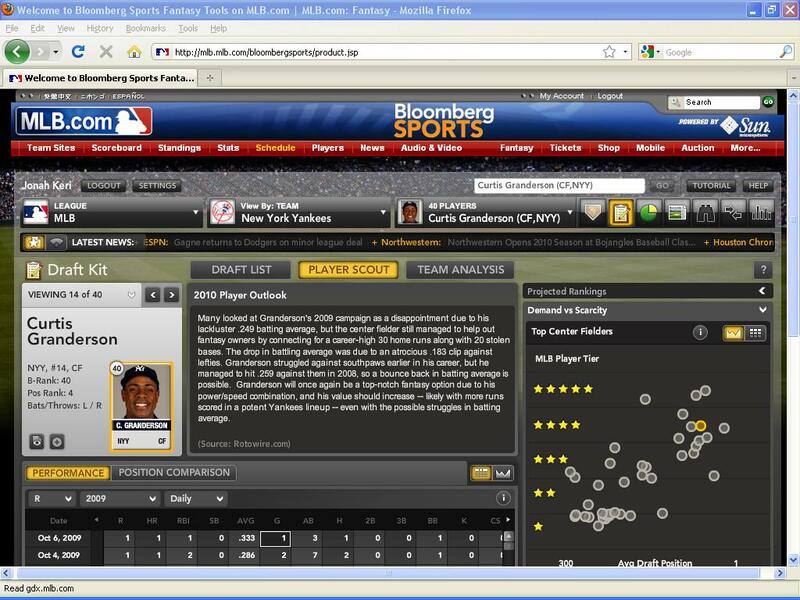 round), I would grab Padres shortstop Everth Cabrera, adding more speed to the roster, and a second Bloomberg Sports Blog-touted option for 2010. With the five-outfielder format of this league, I wanted another power-speed OF early, so Rangers outfielder Nelson Cruz (33 HR, 20 SB, .524 SLG in his first full season last year) made it three such picks in a row, at #75. Then, the pitching onslaught began. In recent weeks, we’ve discussed the huge upside of Marlins starter Ricky Nolasco and Rockies starter Ubaldo Jimenez (as well as his slightly less talented but still solid teammate Jorge de la Rosa). 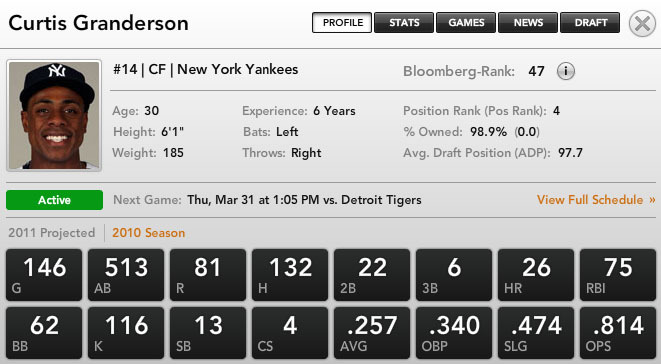 baseman Orlando Hudson in post-draft free agency as a backup). with strong strikeout and ratio numbers. Good to have you, Matt Thornton, Daniel Bard, George Sherrill and Mark Lowe. You’ll be a lot easier to carry all season than shaky Opening Day closers like Matt Capps and (shudder) Matt Lindstrom. You can follow the league, all season long, here. For more on how to build and manage your fantasy team throughout the season, check out Bloomberg Sports’ fantasy kits.